More than a catchy slogan, the message from Horan & McConaty encourages you to continue along your path of living well by managing your own end-of-life arrangements. When the time comes, your family will not have to make decisions that are almost guaranteed to intensify their emotional stress. Likewise, you’ll eliminate potential conflicts over what should be done, including how much to spend. Most importantly, you’ll ensure that your final goodbye is carried out according to your wishes. Having served the Denver area for generations, we are highly experienced and attuned to all kinds of personal matters—religious, financial, family dynamics and more. Sensitive and professional, we are here to offer our knowledge and experience in guiding you. 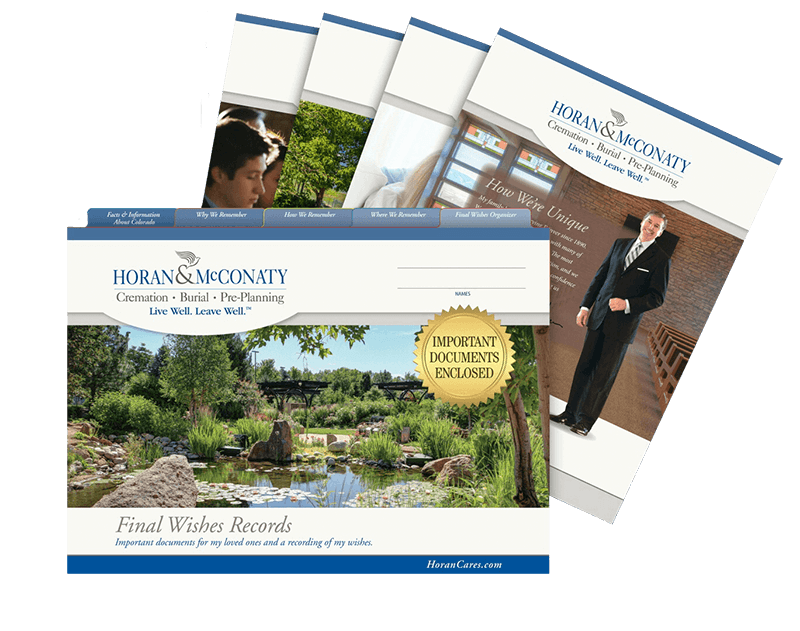 To help you get started, we invite you to order Horan & McConaty’s complimentary Pre-Planning Kit. I am grateful to Horan and McConaty, and to JaCobe Payne, funeral director. They did a superb job helping us plan our mother's service, and it all went beautifully. Communication was excellent. Everyone was so caring and respectful. Highly recommend!